When people think of organized crime in America Al Capone if one of the first figures that everyone thinks of. The Chicago-based crime lord made a fortune in the black market for alcohol in the 1920s and he became the most notorious gangster from the era of Prohibition. In 1931, he was convicted of tax evasion and sentenced to eight years in Alcatraz. After getting out of prison he bought an estate in Miami Beach for $40,000 in cash where he lived until his death in 1947 at the age of 48. Well it turns out that Capone and his successors could have made a fortune through more legitimate means with this house. The house where Capone spent the final years of his life recently sold for $7,431,750 according to Zillow. Adjusting for inflation the home’s value appreciated by $6.7 million between the time Capone bought the house and today. The estate has a two guesthouses and a 30′ x 60′ swimming pool and everything was recently renovated to add the most modern of amenities. Even if Capone had lived another 25 years the house’s value would have long since recouped the initial investment. Just consider that if alcohol wasn’t illegal in the 1920s Al Capone would have been a microbrewer instead of a mafia boss, but he still could have become a wildly successful real estate mogul in Miami. It sure beats Alcatraz as a retirement home. Churchill has short-term rental apartments throughout Florida and Nationwide. Please contact us at 866-255-0593 or email National@FurnishedHousing.com for more information. The year 2013 has a special anniversary for Florida. Exactly 500 years ago in 1513 the Spanish explorer Juan Ponce de Leon discovered the shores of Florida and named the land Florida due to the many wild blooming flowers he found there. Florida would then become home to the first permanent European settlement on the continent of North America. One of the many things happening to commemorate this occasion is the visit of a replica of a Spanish galleon to Florida. There is currently a replica of a 1526 Spanish galleon in the marina of Fort Lauderdale available for tours. Though this ship is larger than the caravel that Ponce de Leon used to find Florida, it is a wonderful insight into the types of ships that were used by explorers during the Age of Discovery and you can get a idea of what it was like to be a sailor back in the sixteenth century. 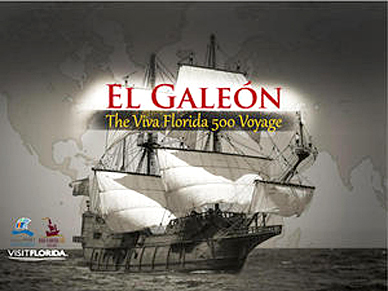 Tours of the ship El Galeon are available for free here courtesy of Broward County. 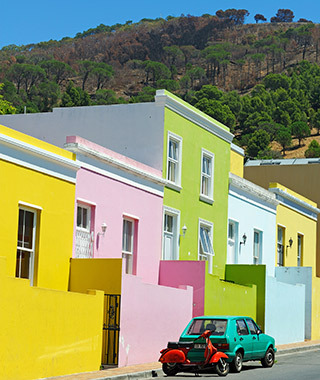 No, that’s not a rainbow at the foot of Signal Hill: the pops of color making their way up the slopes are typical of Cape Town’s historic Muslim quarter, where the mosques and homes make up a splashy kaleidoscope of aquamarine, fuchsia, and lime. Its Cape Malay community is descended from slaves brought over by the Dutch from Southeast Asia in the 1600s, and residents began painting their homes to celebrate the end of apartheid. 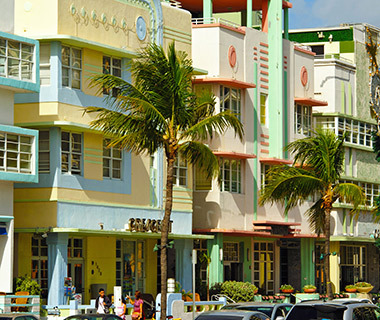 Neon lights, frothy façades, quirky patterned lifeguard stands, Art Deco buildings—driving along Ocean Drive in Miami is a retro trip back to an era when Technicolor was just bursting onto screens. Flamingo pinks and tropical greens flank the white sand on one side, with azure waters on the other. In 2010, Dutch artists Haas&Hahn schemed to turn a favela in Rio de Janeiro into a giant canvas for their third project in that city’s slums (favelapainting.com). 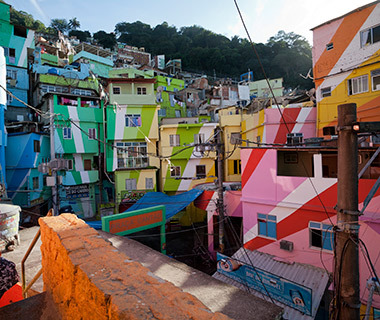 Enlisting the help of local youth, they converted the homes of Favela Santa Maria into a rainbow of staggering proportions, composed of rays in myriad shades radiating across the façades. These postcard-perfect pastel pink, lemon yellow, and sea green façades were hit by devastating floods in 2011. 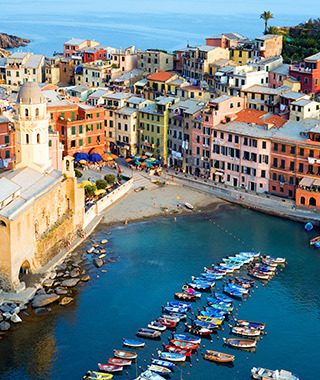 While the damage to Vernazza and the four other scenic waterfront villages that make up Cinque Terre was severe, efforts are under way to restore, rebuild—and repaint. 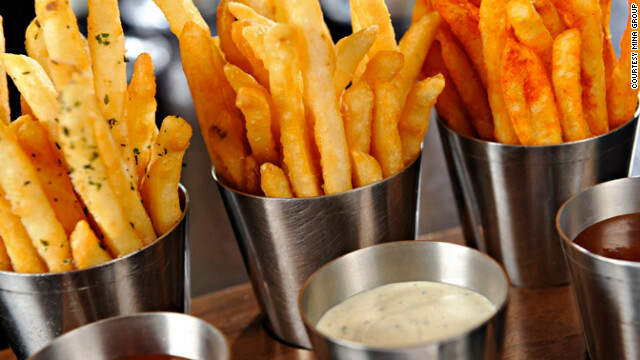 Miami is a diverse city jam-packed with culture, history, entertainment and more. NBCNews.com Travel Section showcases some top Miami locations that visitors may now know about. View the original article here. 1. 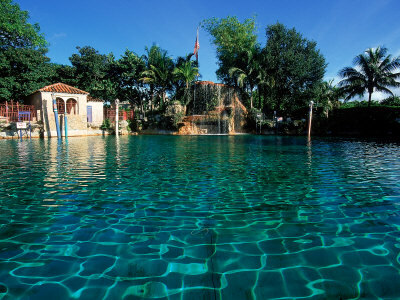 Venetian Pool: Created in 1923 from a coral rock quarry, this public pool takes swimming to a whole new level. The 820,000 gallon pool is the only pool to be listed on the National Register of Historic Places and features loggias, porticos, beautiful grottos, striped pillars, and a Venetian-style bridge. 2. Neptune Memorial Reef: Just of Key Biscayne, the Neptune Memorial Reef is the largest man-made reed ever conceived. 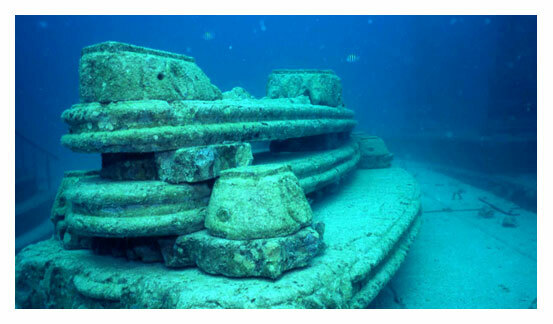 It was designed to resemble the feel of an Atlantis-style lost city with columns, statues, and detailed structures beneath the water’s surface. Once completed, the reef will span over 16 acres. The creators of the reef, Neptune Society, estimate that the reef will become the final resting place for 100,000 people. It is free and accessible to all visitors. 3. 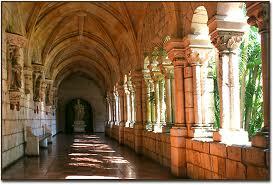 Ancient Spanish Monastery: The story of this monastery is remarkable! William Randolph Hearst bought the structure in Spain in 1925. He then had it disassembled stone by stone and shipped from Sacramenia to the US. His financial problems caused the pieces to sit in storage for 26 years before they were purchased and put back together by two entrepreneurs in 1953. The monastery serves as an Episcopal church now. 4. 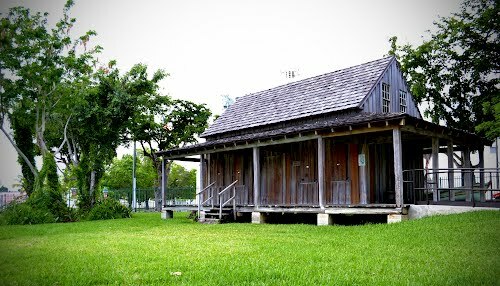 William Wagner House: The oldest house in Miami-Dade County is located in Lummus Park. It was built back in the 1850s when William Wagner was homesteading on a tributary of the Miami River. Visitors are often shocked that anyone could live in such conditions- no air conditioning, screens, and very little comforts. 5. 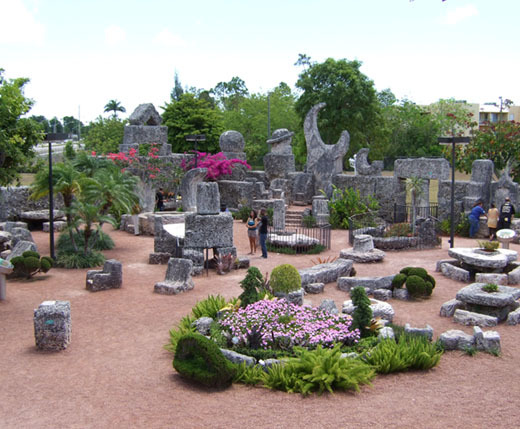 Coral Castle: This sculpture garden was created by a Latvian immigrant who was jilted by his fiancé, Agnes Scuffs, just one day before the wedding. The sculpture garden was erected in such a strange way that many believe he had supernatural powers. Between the years of 1923 to 1951, he carved over 1,100 tons of coral rock all by himself. It is unknown how Leeskalnin, who was a mere 5 foot tall and only weighed 100 pounds, created and moved the giant stone sculptures. He died without revealing the mystery. 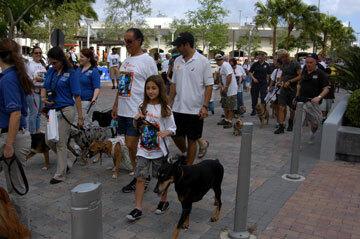 This Sunday, March 3rd, Miami Lighthouse is hosting the Sixth Annual “Walk, Waggle, and Stroll” Dog Walk. The event raises awareness for guide dogs and service dogs of all kinds while proceeds support the Miami Lighthouse for the Blind & Visually Impaired. The event will be held at The Shops at Midtown Miami, 3401 North Miami Avenue. Registration begins at 9 AM and the walk starts at 9:30 AM. Walkers are welcome with or without their dogs so if you don’t have a pooch, feel free to attend the event anyway. Registration is $25. Print and fill out a registration form here. In addition to the walk, scheduled activities include a “Bagel & Bones” breakfast, talented doggie contest and prizes, goodie bags, and live entertainment. For a fun-filled day of dogs that benefits a wonderful cause, the “Walk, Waggle, and Stroll” is an event you won’t want to miss!